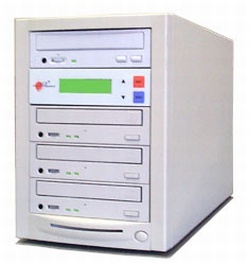 RELIABILITY AND COMPATIBILITY -- The included DVD writer drives used in this model duplicator are the famous and very reliable Plextor PX-708A model drives. They burn +/-R discs at 1x, 2x, 4x, or 8x as appropriate for the matching media being used. You can depend on this drive, since it is truly the standard for the industry. This model is firmware upgradable.